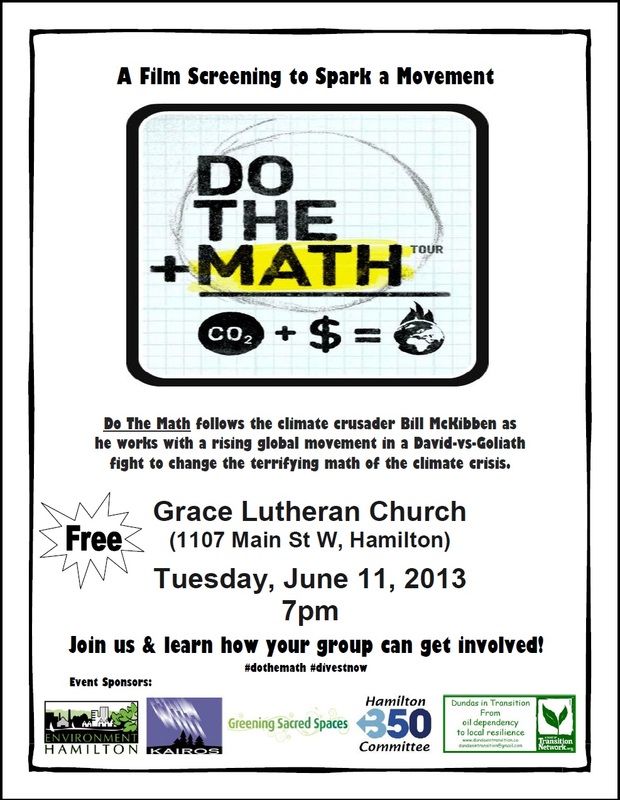 Fellow sustainability-minded folks are invited to come out on Tuesday June 11th at 7:00 pm to the Grace Lutheran Church, located at 1107 Main St West in Hamilton, Ontario, to join us in a screening of the documentary film, Do the Math. The documentary follows 350.org founder Bill McKibben on his Do the Math tour in November of 2012. That tour reached over 25,000 people at sold-out shows in 21 cities across the United States (and tens of thousands more online). Part TEDTalk, part revival meeting, the Do the Math show is based on his article, “Global Warming’s Terrifying New Math“, published in Rolling Stone in the summer of 2012. The piece became one of the most viral stories ever published by the magazine, garnering over 125,000 likes on Facebook and millions of page views. In the article, and onstage throughout the tour, Bill laid out three numbers that explain our current crisis: In order to limit global warming to below 2 degrees Celsius, scientists say we can emit only 565 more gigatons of carbon dioxide into the atmosphere, but the fossil fuel industry has roughly 2,795 gigatons of carbon dioxide just in their reserves, over five times too much. In other words, the fossil fuel industry is a rogue industry. They are outlaws not against the laws of the United States (for the most part they get to write those laws) but against the laws of physics and chemistry. The rest of his bio can be found here. ‹ Global Wind Day Open House: Saturday, June 15th!